Experiment: Change House's Paint Colors, Make It Attractive. Possible? What if you did nothing more to a house's exterior than change three of its paint colors? Exterior paint schemes typically involve three or four colors: wall (also called field); trim (fascia, eaves, posts, window casing, corner boards, etc. ); door (most any door can be painted, even metal doors); and accents (also doors, shutters, etc.). Here we offer you a basic set of exterior paint schemes and themes built with Sherwin-Williams paint. A woodsy exterior scheme for the Twin Peaks in all of us. * Dard Hunter was a print-maker instrumental in the Arts & Crafts movement--which fits perfectly with this type of green. What gives this paint scheme such a sugary look? Take a gander at the field--it's just plain old easy-going Casa Blanca. Buy add Rosedust (dusty rose, shall we say? ), and it becomes something else entirely. Something dustier. Rosier. Sweeter. There it is: The power of trim. But for that punch-in-the-mouth Poppy Flower door, it's a calm classic. Who knows: maybe that red is necessary? Here is a dark, quiet, sedate exterior paint color scheme featuring a rich Nautical SW7615. Got a house stuck in a shadowy spot? Need to give it some pizazz? This field color, Grandiose, is just the ticket to pull your house away from the darker background. Looking for strong, assertive, yet comforting and...sturdy exterior paint color schemes? Check out this Sturdy Brown field, with a nice counterpoint of fresh Sequin on the trim. 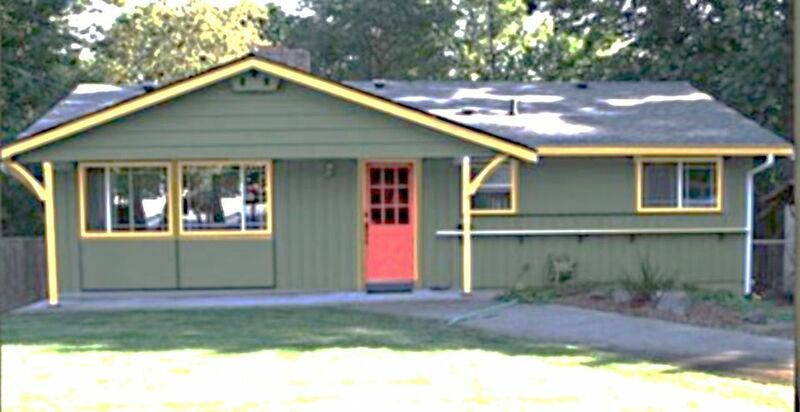 Some communities have shocking exterior paint color schemes, some don't. If you live in a place like New Orleans' Upper Garden District, it's almost de rigueur to have blatantly shocking and cheerful colors. Shocking or normal, it all depends on where you live. Careful with gray in exterior paint colors, unless you want to drag the whole house down. This Gauntlet Gray keeps everything cool and sophisticated. Bronze, gray, and emerald: precious stones and metals provide your house with grace and stature. A low-key exterior paint color design that fits right in with the earth: Sherwin-Williams' Colonial Stones.